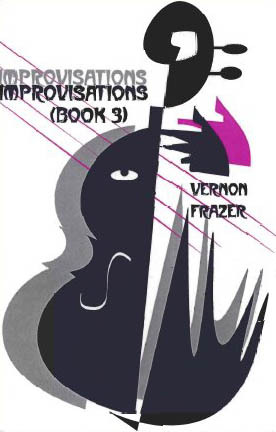 Vernon Frazer's Improvisations (Book 3) takes us on an intricately vertigineous poetic journey. In book three of his open-ended long poem, Frazer continues his alleotorically epistemological poetic investigations. There is no such thing as a static moment in a Frazer Improvisation. Like the title suggests, meaning and content are in a constant state of flux and our expectations are artistically contorted into ever-morphing concretions of possibilites. Thus the genius of Frazer's dense allusive constructs. At times his words almost seem to defy the gravity of the page on which they are written. Reading a Frazer Improvisation is akin to taking a cerebral rollercoaster ride, with each dip and curve more exhilarating and unnerving than the one before it. To say that these semantic structures are simply 'poems' is to do them a disservice. They are the intellectual gems of a deeply poetic mind's textual alchemy. In their content, we seem to enter into Frazer's laboratory and witness firsthand the workings of his eccentrically fecund imagination, where he plumbs his and our reality with a microscopic (if not quantum) precision. We are presented with a sensibility which is sifted through all scales of reticular membranes, and the finished product we see on the page is a polished crystalline diadem to admire. It is a monumental yet rewarding task just to wade through Improvisations; but one must immerse oneself in its whole being and fabric to derive the poetic fufillment to which it aspires, and delivers. I can at most, in this review, speak only to limited aspects of this work's all-encompassing nature. It is a work which must be experienced both viscerally and cerebreally; thereby achieving its full potential in the life of the reader. Although Improvisations (Book 3) is its own autonomous entity, I feel a brief introduction to the other two books in the series would serve the reader well. Here we have another major thread which weaves itself through the work: the allusion to music, melody, dissonance, ambient otherness, coalescing into form: the form which will make itself known to us if we 'play', listen, or read long enough. Music is all-present, all pervasive, and one of the unifying factors solidifying the work. The title, Improvisations, speaks to the obvious assertion of its musical intentionality, and like a symphony, there are many individual constituents which combine to create a unified resonant whole. Improvisations is a work of an intricately diverse intelligibility. Its facets radiate out a poetic luminescence which will enlighten the reader's mind and lead them through an ever-changing semantic labyrinth. I must admit that this cursory outline does little but scratch the surface of this work's incredibly dense essence. But it is the irony of words to enlighten us at the same time they limit us, by constricting our vision to all the eye can encompass, yet never fathom all that can be imagined in the mind.